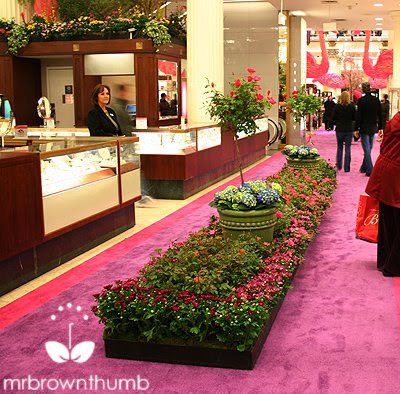 Macy's on State Street ushers in spring with the flower show Dream in Color. For someone like me, who professes to hate pink flowers in the garden it sounds more like a Nightmare in Color. So I was surprised at my reaction of Dream in Color, I actually liked it! The annual flower show at Macy's on State Street is a holdover from the Marshall Field's era in Chicago. Full disclosure; I once worked at Marshall Field's when I was going to school and I was one of the anti-Macy's crowd when they bought the beloved Field's. I swore up and down to anyone who would listen that I would never step foot inside of "Macy's." Today was the first day I have been inside the store since it stopped being Marshall Field's. 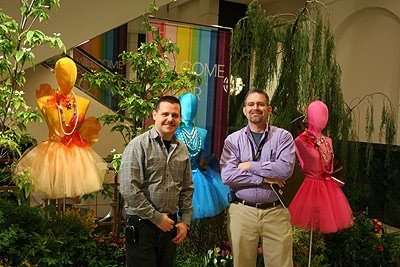 A week or so ago, Marisa Reeves (Media Relations Manager for Macy’s East, North Region), offered to set up a tour of the show for local garden bloggers with the Jon Jones (Visual Director for Macy's on State Street) & Todd Pope (Branch Manager for Green View's Oswego location). My Skinny Garden & Garden Girl found time in their schedules to attend. And that is how my boycott of Macy's & pink flowers ended. I'm a realist and I know that the purpose of the flower show is to get people into the store and hope they buy or become loyal customers. Gimmicks like this usually don't appeal to me but the show is a lot of fun and realistic. What do you mean by "realistic?" A lot of times flower shows like this tend to lean towards the theatrical and use plants that the visitor can't grow in their Zone. Dream in Color uses a combination of perennials that can be planted in Chicago interspersed with flowers & plants that are too tender and won't survive a Chicago winter. But you can actually walk away from Dream in Color with inspiration that is practical and a plant list you can find at a local garden center to start a garden in Chicago. Besides ideas for plants for your garden and color combinations you can use in your garden you can also gather ideas for gardening in small spaces like patios, decks and that annoying spot between the street and the sidewalk that nobody ever knows what to do with. I think we could talk My Skinny Garden into wearing one of these if Macy's would become a sponsor of the national garden blogger gathering Chicago Spring Fling. My favorite installation is the flamingo topiary. 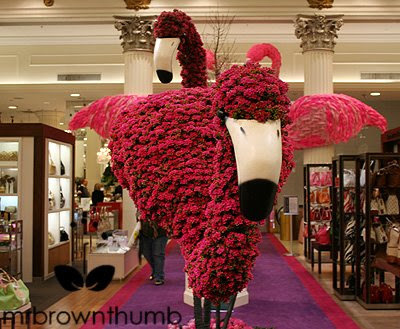 If I recall correctly each flamingo had over 2,000 kalanchoes painstakingly added. The frames had to be rotated so all the plants would receive equal amount of light to prevent them from becoming lopsided. Here is an overhead view of the garden installation. The topiaries are underplanted with tulips, azaleas and chrysanthemums. The turf is created with wheat grass that has to be cut by hand and maintained during the run of the flower show. This is an overhead view of the Walnut Room. 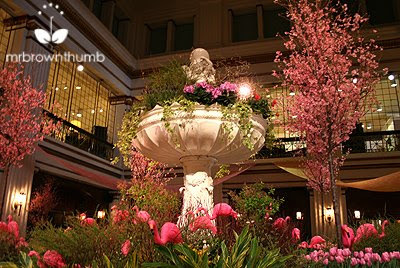 As you can see, even the fountain in the Walnut Room was turned into a garden and has been invaded by pink flamingos. There are many tablescapes and items throughout the store that can give you inspiration. 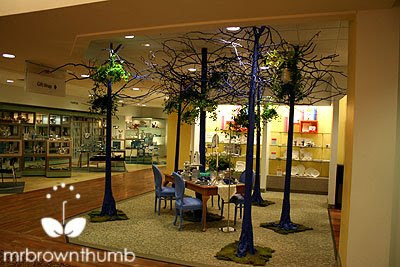 I don't know how I'd pull this off but I have to have blue trees like this in my garden. I actually took a picture of the tablescape inspired by The Tudors but didn't include it because I figure that tablescape will be visible in other locations. I called this one the Hewlett-Packard Garden because it was built around the HP Mini. 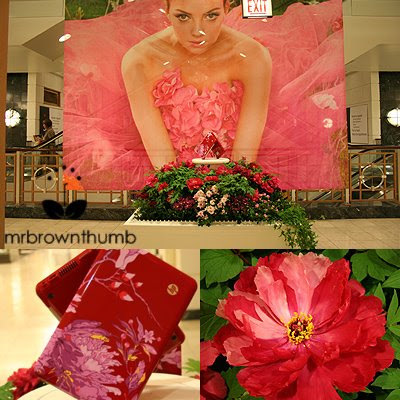 The peonies in the design by Vivienne Tam are picked up by the real life tree peonies. We were told these mini-notebooks have been displayed as clutch purses on the fashion runways. I loved this square topiary planted with succulents on the first floor. Like I said, there are a lot of neat ideas you can take from the displays on the first floor for gardening in small spaces. This one is an interesting topiary shape I never would have considered-but it works. Fashion & flowers collide all over the place. The Betsey Johnson garden seems a little subdued and not as over the top as I was expecting. I'm not sure if this was intended, but viewing this garden installation I thought the trees looked rather menacing and looked like they were lurching over the fairy-like mannequins. Since My Skinny Garden and Garden Girl had also been to the Chicago Flower & Garden Show the first thing that came to mind was the bee topiary in the installation by the Chicago High School for Agricultural Sciences, when we saw the dragonfly topiary. A view of the flamingos and cherry trees from the second floor. If you attend Dream in Color you should enter either through the Randolph or Washington entrances so you get to walk underneath the giant flamingos. There are fifteen cherry trees used throughout the show and they had to be put, alternately, in a greenhouse and in refrigerated trucks to get them to bloom for the show. If I remember correctly all fifteen will be replaced at some point in the show to keep the flower show fully stocked in cherry blossoms. Whenever you're in Macy's you should make it a point to look up and see the amazing Tiffany Ceiling. On the left is Jon Jones, Visual Director for Macy's on State Street. On the right is Todd Pope, Branch Manager for Green View's Oswego location. Green View is the floral partner for Dream in Color. Together with Marisa Reeves they provided us with an educational and funny tour of the flower show. Jon, if you read this I could probably make a centerpiece of one of the large flamingos. Todd if you need to unload any of those plants I could probably find two or three garden bloggers who would take them off your hands. Thanks for the tour. Flower show tours by the University of Illinois Extension Master Gardeners every Thursday-Sunday throughout the duration of the show, 11 a.m., 1 p.m., & 3 p.m.
Rose Gardening tips by the University of Illinois Extension Master Gardeners every Friday & Saturday through the duration of the show, 12:10 and 12:40 p.m.
Saturday, April 11, 5th Floor Children's Department, 1-3 p.m. 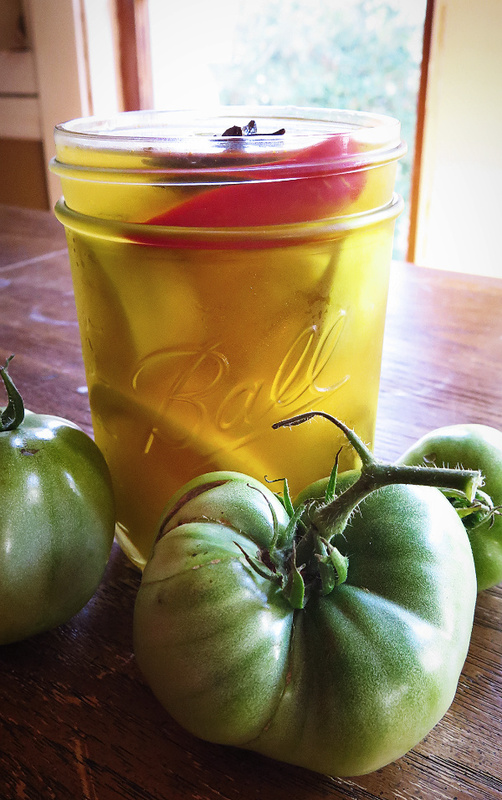 Kids will learn the basics of worm composting, including learning about Red Wigglers. Saturday, 18, 5th Floor Children's Department, 1-3 p.m. The Traveling Bug Brigade by the University of Illinois Extension Master Gardener staff. 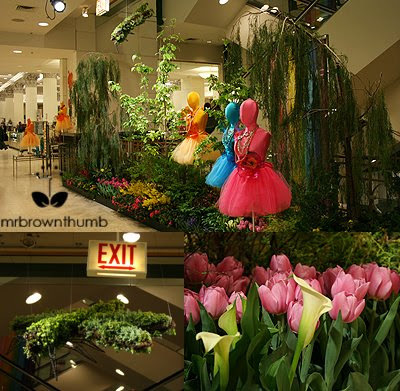 Macy's Flower Show 2011 Preview. My photo gallery for Chicago Garden with pictures from the media preview of the 2011 show. The theme is "Towers of Flowers". 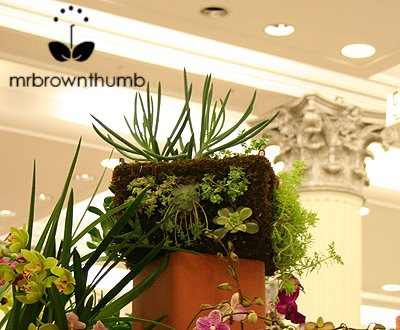 Macy's Flower Show Bromeliads & Succulents. My post here on this blog about the cacti & succulent garden display and the bromeliads featured in the show. Yupp, that was a lot of pink, but sooner or later the colour charms you. The displays at the Nordic Gardens Fair in Sweden had a lot of pink, and a flower fashion show too. I think we are dealing with an international trend here. I do lots of pink in the garden, and needed no convincing. Raising three daughters, I had no choice but to make peace with pink, and it's a sentimental favorite color of mine. I'd wear one of those hats to the Spring Fling too, maybe even one of the tutus if Macy's became one of our sponsors! LOL, I know what you mean about pink. I'm not wild about the color, except that I am. Which is to say, I think I don't like it, but then I do! There are some really cool retro Pyrex casserole dishes in pink I like and I can name any numbers of pink flowers I like... but, mentally, I'm just not a pink person, if that makes sense! In any case, I love the flamingos--just my style! 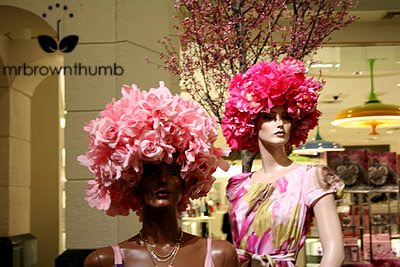 And while I'm not into fashion, either, I do love how they integrated the flowers with mannequins and other store-type displays. Sounds like a great show that I'm sorry I'm missing. Sure looks like a lot of fun, the flowers look beautiful and a great setting throughout the store. I went to the Macy's flower show in Minneapolis two years ago, I think, and found it mostly just upsetting. Plants misidentified, plants claiming to be from Africa that were not, in fact, from Africa (I believe Africa was the theme of the show), and nothing all that terribly new or exciting to me. Also I was with my husband, mother-out-law, sister-out-law, and s.o.l. 's baby daughter, and none of us were especially happy with the way the day was turning out, and it was cold and raining and parking was nightmarish, and so on and so forth, so I was probably not objective. I'd have a different perspective on it now, too, having worked in a garden center for a while, but at the time it mainly just made me kind of crazy. I wonder why Macy's doesn't have a flower show here in Phoenix. I would have to attend for sure. In the 1990s I was in Chicago on business, and walked down to Marshall Fields to see the Christmas window displays. That was the last year they had it. I went in the store and was amazed at the architecture. I was so impressed with the whole thing I remember the details to this day. You're getting all soft on us with the flowers, MBT! But we are gardeners, we understand why you would go in there to see those flowers. I would have, too. Our Macy's locally is not so grand, I can't imagine they have a flower show in it. It's too bad this one will be long gone by the time we are all in Chicago for Spring Fling. Thanks for sharing, great pictures and notes! Oh God, this is unbelieveable!!! Fantastic...one day I will get to NY! I have a Macys or two here...I wonder if they are going on a similar theme right now. I will go give it a look! The giant flamingos and cherry trees are just magnificent!!! WOW! It is so wonderful to see nature and art in combinaton.The square topiary with succulents can be viewed from below and all sides, very good idea and selection of succulents. Thank you for the good pictures! Btw, thank you for dropping by my blog. Have a wonderful week! A grand show and the flamingos are incredible....you photos are stellar! I am not really big on pink, with the exception of my peonies. The show did look like a wonderful display. They went all out. I don't really mind the pink if its aranged tastefully. But there's something that bother me about your pictures. 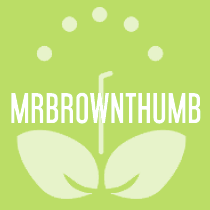 It's your "mrbrownthumb" thing. Many of them catching attention more than they should..
A spectacular flower show ! That's not my style but it's certainly jaw dropping! Great blog! Can not wait to read more! My girl never planted a thing in her life, till she was pregnant 14 years ago (b-4 me) and since then she LOVES to garden. Once she went to the Bath flower festival in England... unbelievable!! You know what, after reading this item, I felt that I am actually attended the show, the colors of your photos are vivid and vibrant. And the description of the events are pretty well said. Have a great day. Just what is needed in a season of browns and dull greens ... bright colors and visual excitement! I love the pink flamingo's and fountain but it's all beautiful. Thanks for bringing it to us. Wow. Absolutely amazing. This must have been a blast for you. I haven't been to the Walnut Room in years and I don't remember it ever looking so un-stuffy. Congratulations on being Blog of Note! Looking forward to reading lots more interesting posts! Very nice photos. A great show! if only philly's flower show had been pink! i adore pink flowers. ours was themed Italy. it was gorgeous as well, lots of daffodils. :::sigh::: it made me sad. i grew up going to Marhall Field's on State Street every year at Christmastime. it was a tradition to go with my nana and her friend, lotie, and we'd take the train. 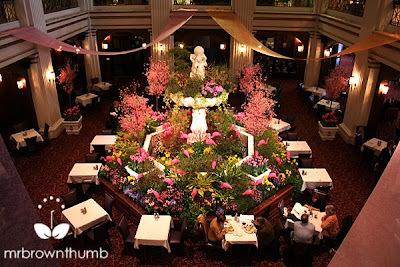 we always ate at the walnut room and would wait to sit under the tree. i threw a fit when they changed the name. i felt like a piece of chicago's history and my history had gone down the drain. i would never be able to share that experience with my granddaughter. i, too, have said i'll never go in there, and i'm sticking to that. 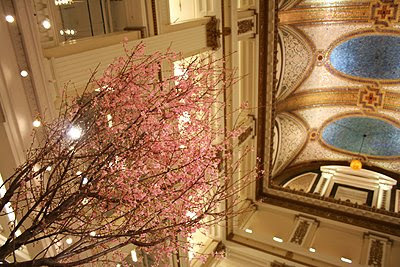 thank you for sharing the pictures...i thought the walnut room looked beautiful and it was nice to "see" it again. The show is absolutely stunning! Your pictures did it justice. I'm saddened I can't walk the aisles and enjoy the displays myself. Much too far away to drop by. Best post about flowers I ever seen. It's one of the most beautiful flower shows I have ever seen on the web. Outstanding combination of flowers and art. Pink color is adding more to the beauty. 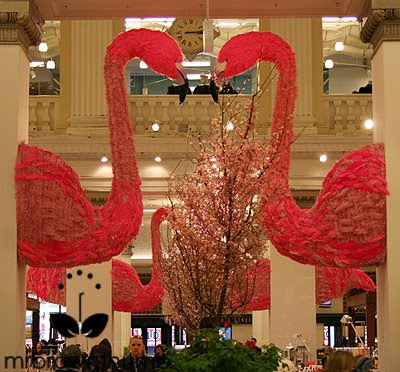 Is there a "poster" available to purchase for the Flamingos in Macy's? Absolutely GORGEOUS! I've got to get one of those flower wigs. Believe me I'd wear it. OhMyFlamingos! Congrats on Blog of Note, which brought me here and for a moment had me considering an immediate vacation just to visit Macy's and the show! Thank you soooo much for letting me vacation without using up vacation days! thanks for this floral story...among other things i'm relieved not to be a cherry tree vacillating between an ice truck and a hothouse! wow the flamingos are beautiful! Congrats on being Blog of Note, It is blogs like yours that keep me coming back...great content and set up...keep up the awesome work!!!! again congrats!!!! From Chris Bassoo Family and the Bassoo Clan in Canada!!! Thanks for the sharing. I lived in chicago for 2 years and so in love with this city!! I am living in the south now and how do I miss NYC. Where else in the world can you see such awesome things in such a grand city. lovely blog. I love gardening but since i live in an apartment- i just do it in a few pots. simply love it when the flowers bloom. just cant beat the feeling!!! Good point about these shows using un-grow-able plants. It's as if we are viewing a pretend exhibit, never to be duplicated. Gives us ideas, but of what? Here in Zone 9, weeds grow great. I've got some milkweed started and am hoping for Monarchs. Rosemary does really well as does lavendar for bees and hummingbirds. Some rockrose, fushia if we keep it next to the house during frost. Do you see any birds at these shows? or butterflies? Wow! Those are truly amazing flower show ..Too bad I missed it! A giant pink flower flamingo is simultaneously awesome and terrifying. I want one. I just love flowers and this time of the year...wonderful pictures and great blog! Amazing pics! Wish I could go there someday, I'm completely astonished. wow. very pretty arrangements. cute flamingos. Congrats for being on Blogs of Note!! Wow! It looks so gorgeous! I bet it smells wonderful in there too! 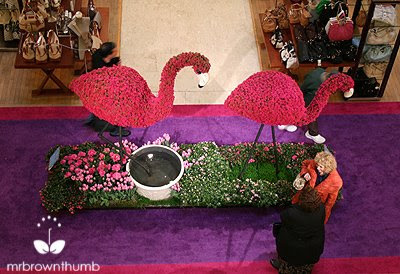 Well, if the pink flamingos and flowers don't bring in the shoppers, Macy's may as well just pack it in. You did a great job helping them out with this post, MBT! The Flamingos are amazing I wish i could have seen them. I hope one day you could recreate this fantastic display in England somewhere and i will travel to see it! Is this the old Marshall Fields? What an incredible display. You are very lucky! I've just got one word for you Marshall Fields holdouts. Boy, how we miss our hometown stores, don't we? It's very sad. These flamingos look super creepy from space. And worse through my giant super awesome space telescope. I sure wish there was something so creative and beautiful for vegetable or fruit bearing plants. I haven't seen any shows like that- does anyone know of any? Viva la Pink Flamingos! Absolutely in awe and amazed at your talent and the quirkiness you sneak into it. Thanks for this great pictorial, I loved it! Its truly amazing in person! I too am from Chicago. Years ago, my sister's first job out of high school was at Marshall Field. I was one of the people who said I wouldn't go into Macy's after they went back on their word about not changing the store's name. Well, I did finally ... and it made me sad. There was a classy element about the old store that's sorely missing today (flower displays notwithstanding). I know things change, but for me, this is not for the better. Color me SAD. It's a very nice blogs and the picture in this blogs is very good. Oh, how I miss living in the city. I will have to live like a Peeping Tom through my computer and rely on sites such as your own for what makes my heart smile. Thank you for posting this - I was just journaling about the wonderful surprise my 3-year-old and I happened upon at Macy's when we went there for lunch last week. That show was truly fantastic. It was the first time I'd been there since it ceased to be Marshall Field's too! I was trying to capture the experience in words but turned to the internet to find some pictures and there were your gorgeous photos. Thanks again! Thanks to all that have stopped by and commented since the last time I commented in this post. A great post with fab. photography. The pink flamingos are bordering on over the top but for some reason they fit well in the space and add a bit of fun to the display. I love the way they have toyed with the hideous and made it beautiful. I also really like the Wedgewood inspired section. Very tasteful! 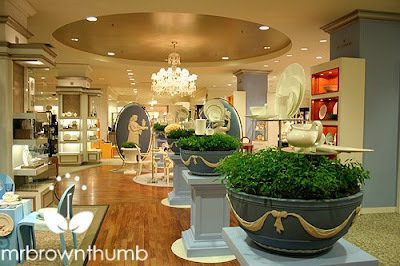 Giant Wedgewood planters look gorgeous! It's all very Alice in Wonderland really and I love it. I'm not a great lover of pink in the garden but overtime I am beginning to see its benefits and I am actually using it more and more.